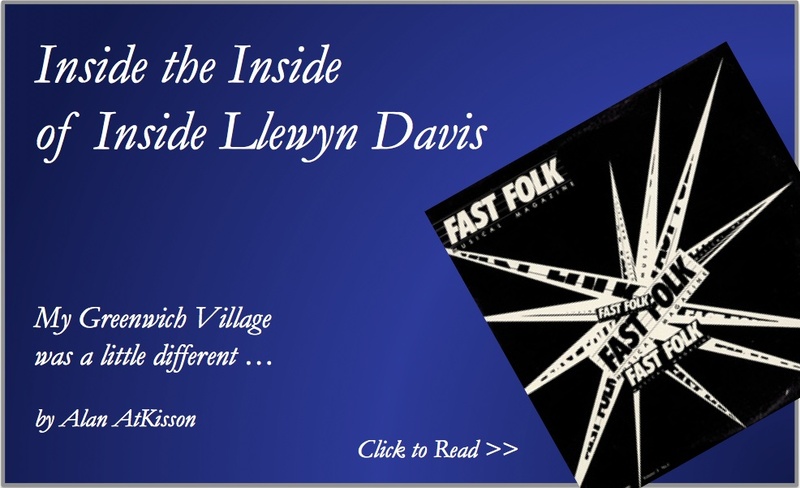 You might expect that I should love the film “Inside Llewyn Davis,” about the folk scene of Greenwich Village in the 1960s, seen through the eyes of a young folk singer, who is a reinterpreted version of the young Dave van Ronk. Van Ronk was a legend by the time I hit that scene, as a young singer-songwriter, in the early 1980s. I barely knew him, but I did work the soundboard for one of his performances at the Speakeasy — a folk music club and artists’ cooperative, which put on nightly shows behind a falafel stand on Macdougal Street. I thought Van Ronk was an awesome performer, with a dominating stage presence. I found him intimidating at the time. Yet despite this semi-personal connection to what was being portrayed on the screen, I did not love “Inside Llewyn Davis.” I found myself skipping and fast-forwarding through big hunks of it, in 10-20 second stuttering hops, trying to find parts I liked. And I did find a few gem moments, most of them musical performances, including a surprising folk turn by Justin Timberlake. The film certainly captured the look of the New York folk music scene as I remember it, which (I now realize) had not changed that much by 1982. Indeed, my experience of New York itself was pretty much just as that movie portrayed it: a little run-down, funkier, more dangerous than the shiny place it is today. So, I didn’t hate the film. But several others from that scene and time — most publicly Christine Lavin and Suzanne Vega — did hate it, and they went public with harsh criticisms. I mostly agree with their general complaint: the movie doesn’t reflect what I remember of life in that community. We were all young, aspiring songwriters, by turns cooperative and competitive, enjoying the feeling that we were part of something with a history. The Greenwich Village folk scene was a kind of musical nebula that occasionally gave birth to a star (Suzanne Vega broke out with two worldwide hits, “Luka” and “Tom’s Diner”, about the time I began turning from aspiring New York musician into an aspiring Seattle sustainability wonk who still did music). But mostly, that community was all about dedication to tradition, craft, songwriting, artistry, mutual support. Being a musician in New York — especially being a songwriter outside the mainstream of pop — was a hard business. We needed each other. This is really my chief complaint about “Inside Llewyn Davis”: I felt nothing of that. In fact, I felt nothing at all. I really wanted to just get through the film and go back to work. (I was watching it on a long plane flight.) A reviewer who loved the movie noted that it’s just a fiction, maybe a profound one, and even called Lavin and Vega “narcissistic” for criticizing it — that is, for not accepting it as an original, aching, coming-of-age story, that has nothing to do with their reality. The Coen Brothers, in that reading, just borrowed bits of Van Ronk’s memoir, and images of that time and scene, in order to tell a different story about misplaced ambitions and the hard treatment dished by the real world on youthful dreams. Well, if you are into making movies, I’ve got a story for you.